Do you have a creative job or a special commitment that requires great ideas on a regular basis? Sometimes, working around the clock is the only way to make it on time. But wouldn’t you agree that your very best creations often appear when you’re not pulling hair over a crazy deadline? Would you like to create with more ease, just to see where it takes you or to use it in your life and business? Here are Katarina’s best tips! When it comes to creation, there is no right or wrong, no magic recipe or how to-manual. If you love to create under extreme pressure, then good for you – just keep it up! However, it’s more common to feel that obligations only choke our creativity. To create and deliver becomes a burden, when it’s supposed to be joyful. Most of us access our creativity with ease when we’re in a state of relaxation. 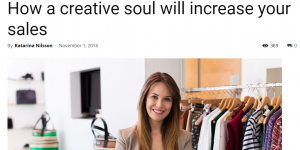 And with a greater sense of creativity comes progress, both when it comes to our souls and our sales. Does it sound obvious? Then why do so many people still build their reality around the demands and expectations of others? It just doesn’t make sense. Why do we automatically start to sing in the shower, or feel renewed and inspired by spending time in nature? The answer is that creation follows harmony, that once we feel at ease we become more receptive to creativity. How many times have you heard artists say: ”The sculpture sort of built itself”, or ,”the lyrics just came to me from nowhere”. It’s not hard to guess they we’re in a pretty good place and that no one held a gun to their head when they created that unforgettable masterpiece. Ever heard of Newton and the apple? Let me give you an example from my own life. I love to paint and when I shape my creations in my studio I always keep a smaller canvas on the side to wipe off spare colour. I never think about it, but more than once, the spare canvas has ended up being more interesting than the ”real painting” that’s just more demanding. When I’m at ease, creation comes to me from unexpected places, I never have to chase it. Would you like to create with more ease, just to see where it takes you or to use it in your life and business? Let go of all projections, expectations and judgments that other people have put on you, and that you have put on yourself. That way you can create more freely. When people judge what you have created they’re not judging you as a person. Simply respond: ”interesting point of view, thank you” and follow what you know is true for you. Creation loves action. Never wait for inspiration, but create to feel inspired. Just get going! Do, don’t think!